Luxury Ocean-front hotel overlooking the famed Fort Lauderdale beach to the east and the Intracoastal Waterway to the west. Developed on a 1.6-acre site located across from the International Swimming Hall of Fame with 136 rooms in a 12-story building. The project also includes a retail breezeway featuring Señor Frog´s bar and grill and Juan Valdez Café. Provided landscape architecture and planning services for the entire project including water feature, pool, planting, hardscape, lighting & irrigation. The design includes a porte cochère arrival area with a cascading fountain flowing from the mezzanine level into the street level. 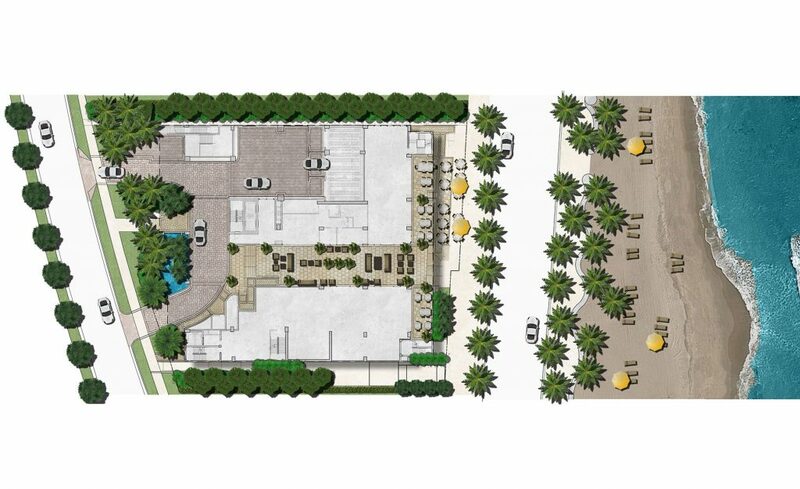 The retail breezeway offers magnificent view corridor connecting both side of the building and serving as gateway to the beach with lush tropical sea-side planting. The elevated amenity deck is built over 4 levels of automated parking with spectacular views of the Atlantic Ocean. The deck provides swimming pool with deck level gutter, spa, decorative trellis and cabana court.